Posted on September 29, 2012 by Michele D.
Please accept my apologies for the lack of blog posts recently. I have to admit that the high holidays have been a whirlwind of chaos at my house. Lots of cooking and guests and such combined with all the work required for my “real” job and taking care of my house. Thank goodness the holidays only come once per year. And yes, I’m purposely ignoring Pesach right now because I’m so darn tired. I started with a recipe for carrot muffins thinking this was something that kids would enjoy and happily eat … not realizing they were also getting some nutritional value. I mixed up the recipe and realized after I’d dumped possibly a tablespoon of baking soda into the batter that the recipe called for a teaspoon. Hmm, did I put in a tablespoon or a teaspoon? I’m so tired who really knows but how much difference can it make. I’m sure it will be fine. It was not fine! I poured the batter into these adorable mini-bundt cake molds and was so excited when the timer sounded to tell me the muffins were ready. I took them out of the oven and offered a bite to my husband. He started chewing the muffin and made the bitter beer face. “Ugh, there is some kind of weird metal after taste,” he said. So I tried the muffin and he wasn’t just whistling Dixie. It was disgusting. And it made me want to cry to have to throw out the whole batch. Then my husband made me totally paranoid by saying that he didn’t think baking soda could be used for food … only cleaning and laundry, which sent me straight to Google to do a search. Fortunately, I learned that baking soda is eatable but I just used too much. Rookie mistake #1 for the evening. After the fact, I decided I should have taken a picture of the muffins in the trash can to show you the full affect but you’ll just have to use your imagination. The photo I included is a parve squash pie I made for Rosh Hashana using fresh butternut squash. There is never a single bite of that pie left. I’ll post the recipe as soon as I get a chance. Next, I had plans to make a vegetable soup and an oven fried chicken. I purchased all of the ingredients but failed to read the recipes when I was copying down the list of necessary items. When I was ready to get started, I read the first sentence for the soup recipe, which told me I needed cheese cloth for the items that would “spice” the soup. I of course had no cheese cloth. I decided to move on to the chicken and discovered that a roasting pan with a meat rack or cookie cooling rack was “vital” to make this chicken crisp all the way around. Also something I didn’t have. Rookie mistake #2 of the night – read the entire recipe when you are making your shopping list. So I had to postone both the soup and the chicken recipes until I had time to go to the store. Ugh. So much for all of my planning. I’m cooking again tonight so here’s hoping this round goes better than the last. Tomorrow I’ll share a recipe for a parve peanut butter pie that is totally awesome and even easier to make. What are you cooking for Sukkot? 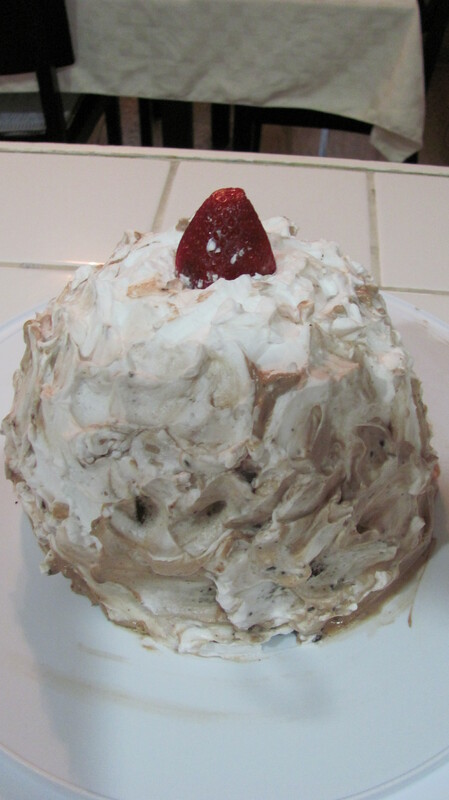 Posted on September 16, 2012 by Michele D.
Kosher Parve Baked Alaska Cake – Yummy! Who knew you could actually bake in the Pampered Chef Classic Batter Bowl? I’m loving it! Chop 1/4 cup of the chocolate morsels using food chopper; set aside. Place remaining chocolate morsels in small Micro-Cooker; microwave, uncovered, on high 20-60 seconds or until melted and smooth, stirring after each 20-second interval. In clean Classic Batter Bowl, whisk cream cheese (Yeah for Tofutti parve Better than Cream Cheese. It’s one of my new best friends : ) until smooth using stainless steel whisk. Add powdered sugar; whisk until smooth. Stir in melted chocolate; mix well. Fold 2 cups of the whipped topping and chopped chocolate into cream cheese mixture using classic scraper. 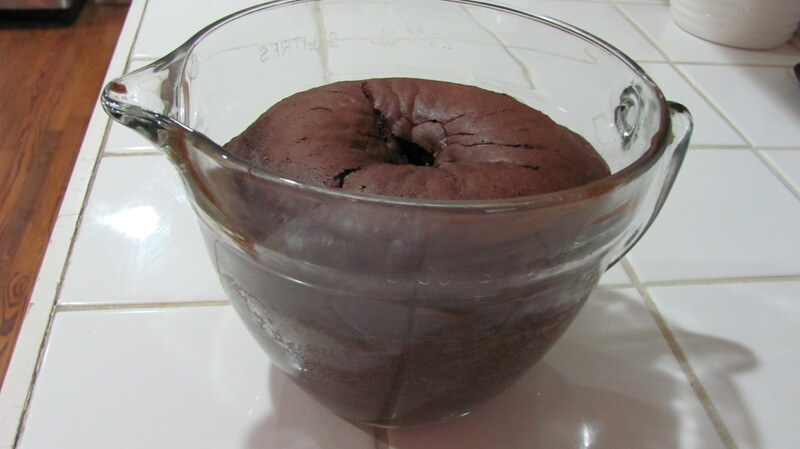 Using small spreader, spread bottom layer of cake with about half of the filling, forming a 3/4-inch layer. Repeat with remaining layers and filling, ending with the top layer of cake. My cake layers were not standing up very well, In fact, they were leaning and sliding to the right so I ended up inserting a wooden stick like you’d use for shish kabobs into the center to hold everything together. I cut off the pointed part and added a strawberry for decoration. To easily cut cake into servings, cut cake into eight wedges from top to bottom using utility knife. Carefully insert Slice ’n Serve horizontally into each wedge, dividing into two equal portions. As I said, my cake did not turn out to look anything like the one pictured in the Pampered Chef booklet but it still tastes delicious and no one will believe it’s parve! Happy Kosher Treif Cooking and Happy Rosh Hashanah! Posted on September 13, 2012 by Michele D.
Looks complicated—cooks easily! This layered loaf looks elegant and tastes terrific. You won’t have to fish for compliments when you serve this to your guests. They’ll fall for it—hook, line, and sinker! 2 Tbsp minced fresh dillweed (I used dried dill an instead of fresh and it still turned out great). 2. Fish Mixture: In a large bowl, combine the gefilte fish mixture, eggs, salt, pepper, and garlic powder. Mix well. Divide the mixture in thirds and place in three separate bowls. 3. First Layer: Combine the fish mixture, red pepper, green onions, and dillweed; mix well. 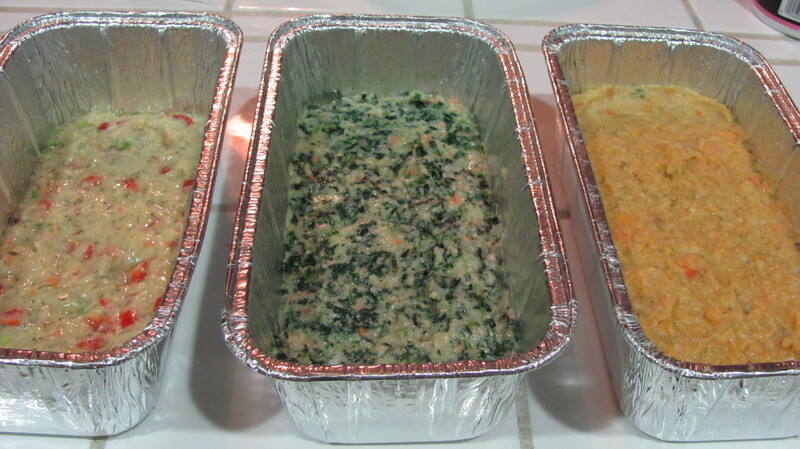 Divide in half and spread evenly in each prepared pan to make a first layer. 4. Second Layer: Combine the fish mixture, spinach, and basil; mix well. Divide in half and spread evenly in each pan to make a second layer. 5. Third Layer: Combine the fish mixture, sweet potato, and dillweed; mix well. Divide in half and spread evenly in each pan to make a third layer. 6. Bake, uncovered, for 1 hour. When done, the top layer should be firm to the touch and the edges should pull away from the sides of the pan. Remove from oven and cool for 20 to 30 minutes. Yield: 2 loaves, 16 to 20 servings. (I made 3 slighly smaller loaves so I’d have one for each email I’m hosting). Posted on September 4, 2012 by Michele D.
To kick off the celebration, Levana Kirschenbaum is giving away a copy of her fabulous new book, The Whole Foods Kosher Kitchen to three lucky winners. To enter, leave a comment on this post. Limit one entry per reader per blog so click over to the other participating blogs below for your chance at additional entries! Giveaway ends 5 am eastern time on September 11th, 2012. When I was thinking of a dish to prepare and write about for the blogger party, my first thought was the Pineapple Challah Kugel recipe that is a staple at our High Holiday’s table. The recipe is in Susie Fishbein’s Kosher By Design Entertains cookbook on page 228. But while the recipe says “it’s pretty,” mine never turns out all that pretty. In fact, it’s somewhat unattractive. But once people take that first bite, they are hooked. I’ve even given this cookbook as a gift to a bride because her husband loved this dish so much. So, if you are looking for a sweet, filling side dish … or it can even be served as a dessert … the Pineapple Challah Kugle can’t be beat. But I thought I’d try something new this year so I spent several hours looking through my stacks of cookbooks and decided upon a new recipe to try … and no one in my household was disappointed. My inlaws even happened to stop by the night of the test, which was also my birthday, so we made a little dinner party out of it. Everyone was in love with this yummy dish that reminds me of a Pina Colada. 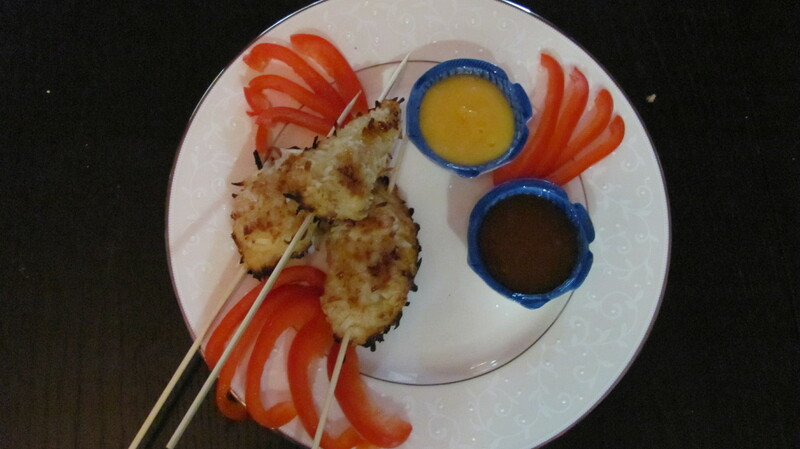 The Coconut Chicken strips with Two Dipping Sauces (apricot and mango) recipe is in the same Kosher By Design Entertains cookbook on page 34 and it is out-of-this-world. 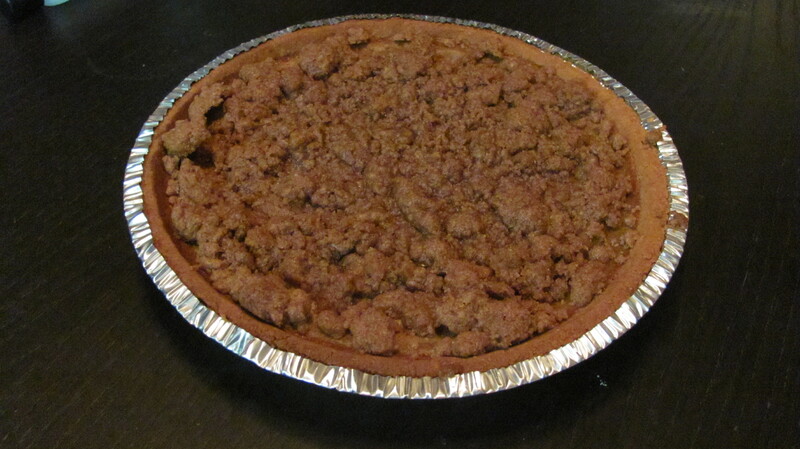 I was thrilled to find the recipe online at Jamie Geller’s Joy of Kosher web site as well. 2. Remove the tenders from the chicken. Cut each breast into long 1⁄2-inch thin strips, trimming the ends to make rectangle shapes. Trim the tenders as well. Season the strips with salt and pepper. 3. Place the flour into a shallow dish. Add some salt and pepper to the flour. Add the garlic powder and cayenne. Toss to combine. Place the beaten egg into a second shallow dish. Mix the panko or corn flake (or Rice Krispies) crumbs and coconut in a third dish. 4. Lightly coat the chicken strips with flour, shaking off excess. Dip each strip into the egg, shaking off excess. Roll into coconut mixture, pressing the coconut into the chicken to evenly coat. 5. Place the coated strips on a baking sheet. Lightly drizzle with honey. Bake 20 minutes, turning the strips halfway through. I added an extra step here. At the end of the oven time, my chicken strips still looked a bit “tan” so I broiled them on high for about 2-3 minutes. It browned the coconut nicely and my Father-in-law thought I had fried them. 6. Meanwhile prepare the sauces. Place the mango into a blender or the bowl of a food processor fitted with a metal blade. Purée. Add the soy milk, wine, and mustard. Pulse 2-3 times. Set aside. 7. Combine apricot preserves, yellow mustard, and teriyaki sauce. Stir to combine. Just a few “tester” notes, the folks at my dinner party, LOVED the apricot sauce but were not so thrilled with the Mango sauce. It wasn’t bad but it just wasn’t as sweet as the apricot sauce. I also made 1/2 of the batch “plain” without the coconut since my hubbie doesn’t like coconut. Even the plain batch was awesome so keep that in mind if you have folks attending your Rosh Hashana party who are not fans of the pina colada flavor.